No summer garden is complete without rewarding agapanthus - a versatile plant that is both water wise and wind- and heat-resistant. Agapanthus are popular plants for the garden, not only because they are low maintenance, but because their beautiful flowers provide a magnificent show from spring right through to autumn. Life is a garden filled with beautiful agapanthus; one plant is pretty, two even better, but for maximum effect plant agapanthus in groups of five, seven or more. 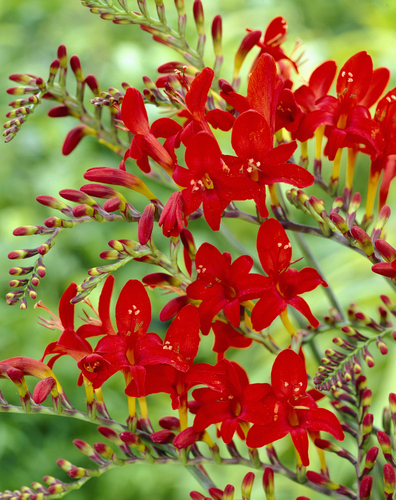 Given sunshine and good soil, these versatile perennials can be grown in borders, on slopes, in indigenous and water wise gardens, in broad sweeps as ground covers and in pots. Even when not in flower, evergreen varieties are useful on slopes, where their strong, fleshy roots will bind the soil. 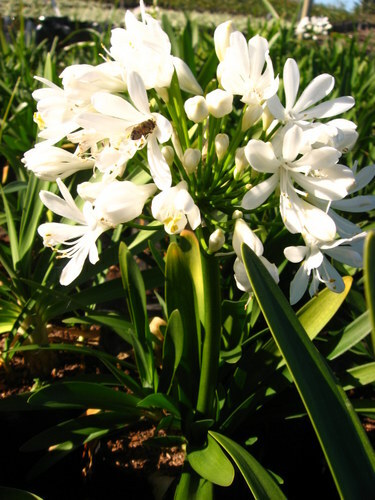 Eye-catching white, powder- and sky-blue, navy, indigo and almost black agapanthus flowers are held on sturdy stems of varying heights above dark green or variegated strap-like foliage. 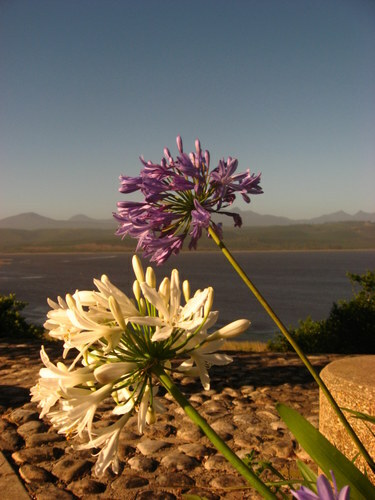 Agapanthus will fit into any colour scheme. White would stand out in a twilight garden; blue shades would look good in a blue summer border or in a blue-yellow colour scheme. 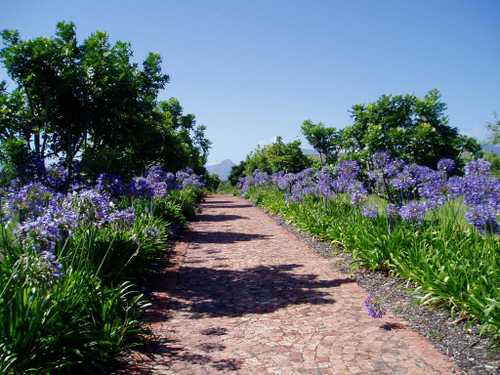 Blue agapanthus would give depth to a pastel border, or complement brightly coloured dahlias, day lilies, rudbeckias and cannas that bloom at the same time. Create a water wise landscape with weathered rocks, clusters of blue agapanthus, Leonotis leonurus and strelitzia, with a ground cover of orange gazania. 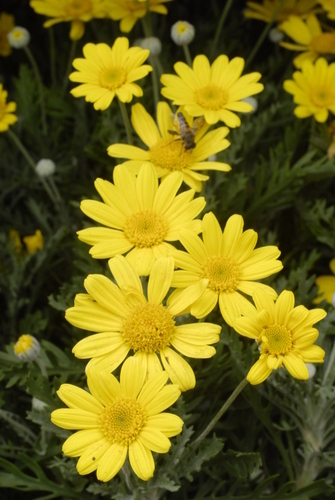 Blue agapanthus with yellow euryops daisy, yellow bulbine and yellow gazanias would also be effective. In indigenous gardens, agapanthus are perfect companions with summer-flowering bulbs of crocosmia, galtonia, eucomis and watsonia. Agapanthus are also striking with sedges or phormiums, such as 'Yellow Wave', and eye-catching among whispering ornamental grasses. They are attractive with silver-grey foliage plants such as artemisia, the indigenous wild rosemary (Eriocephalus africanus) with aromatic foliage and tiny white flowers, lavender and giant-leafed cardoon. Miniature kinds are suitable for edging paths, driveways and borders, and adding colour in rockery pockets and pots. 'Double Diamond' is compact with double white flowers, 'Lapis' is free flowering with azure blue flowers, 'White Ice' bears pure white flowers, 'Amethyst' has blooms with a darker amethyst-coloured stripe in each petal and 'Baby Pete' has a foliage height of about 20cm and blue-toned flowers. Try 'Opal Sky' with white tipped violet-blue blooms on 80cm stems, or 50cm-high sky blue 'Peter Pan', 'Strawberry Ice' with white flowers blushed with pink, and 'Silver Star' with light blue flowers and cream and green leaves. Tall varieties are stunning when grown in bold groups or broad sweeps in the landscape. Try new introductions 'Black Pantha' with intense violet-blue almost black flowers on 60cm stems, and 'Blue Velvet' with dark violet-blue flowers on metre-tall stems. The flowers of 'Blue Ice' are white with an ice-blue base on 1,2m stems, and 'Queen Mum' has bi-colour blue and white flowers on 1,2m stems. Agapanthus with striped foliage are a perfect foil for those with plain green leaves. 'Summer Gold' (40cm) has striking yellow and green variegated leaves and lilac-blue flowers, and 'Blue Zebra' (50cm) has green leaves with a cream edge and light blue flowers. A position in full sun and soil enriched with compost and well-rotted manure will ensure an excellent show in summer. 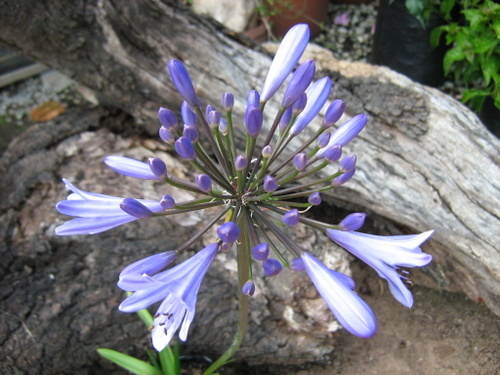 Use a commercial potting mix for container-grown agapanthus. Deciduous varieties are best where heavy frosts occur, and it is advisable to protect agapanthus in cold gardens with a thick layer of mulch or horticultural fleece. When overcrowded, divide after flowering, and because they resent disturbance, the divisions should be of reasonable size.